Bee food for next year is in the ground. On Mother’s Day, we planted 90 lavender plants. We planted 30 each of Buena Vista, Dilly Dilly and Gros Bleu. They came via Karen Grimaud, Blue Mountain Lavender Farm, who helped me select them. My daughter makes a great lavender lemonade and lavender lemon bars. So, I specifically wanted lavender for culinary use, as well as aromatic lavender. English lavender is better for food, since the French lavender contains more camphor, which tends to be bitter. In my case, that would be the Buena Vista. The lavender is planted on a southwest-facing slope on our property. They are starts, which means they are very small. 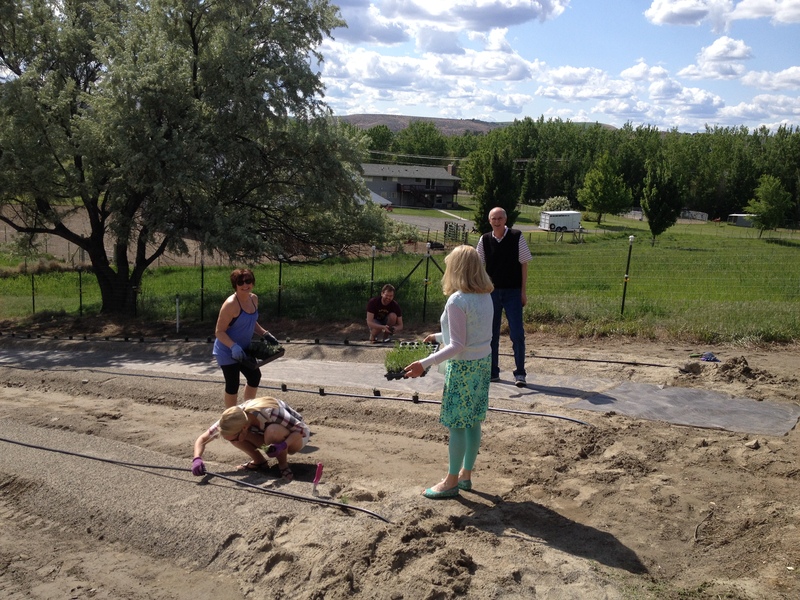 The family plants lavender on Mother’s Day 2014. To promote root growth, I’m supposed to clip any blossoms that form, which means no lavender honey this year. I may plant a few larger lavender plants just to get have something to look at this year. I’ll probably also plant sunflowers so there is more late summer/early fall pollen available. My 90 plants are on a 1/2-gallon per hour drip irrigation system. For the first month, they should be watered every day. After that, they get watered every couple of days. When it’s really hot, I may have to supplement with the existing overhead sprinkling. 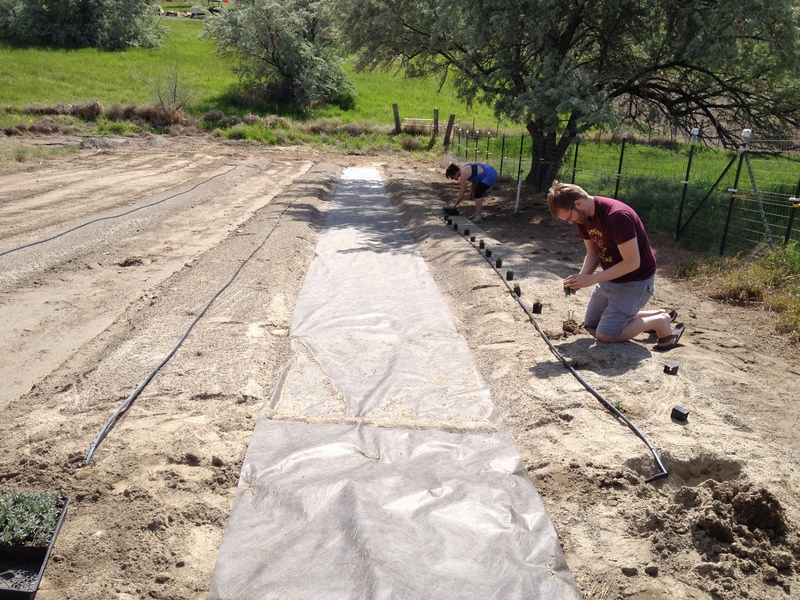 The drip irrigation was intimidating because I’d never worked with it before. But once I got into it, I found out how easy it is to use. It’s so easy that it’s going to become an integral part of my landscaping from here on out. Lavender is a full-sun, dry-climate plant. At seven inches of rain and 400 days a year of sunshine (according to the Tri-Cities Visitor & Convention Bureau), and many days over 100 degrees, it’s a good plant for eastern Washington. It also needs well-drained soil, which we don’t have on our property. We have a soil that is hard and high in clay. When rototilled, it turns into a very fine powder. To compensate, my buddy Floyd Mohr, from Mobile Farm Services, rototilled sand into the soil and form raised rows to promote drainage. We’ll see if that works. Karen also directed me toward Dunning Irrigation in Lowden, Washington, which stocks drip tube with built-in, half-gallon emitters every two feet. Planting one of the three 30-plant rows of lavender. With the periodic removal of my dead poplar trees, I have an abundance of chipped wood. That will go on landscape fabric to keep weeds down between rows of lavender. I guess I’ll have to weed the rows themselves until the lavender grows enough to cover the ground space. My next project will be to identify some bee-friendly trees to replace some of the poplars.